The start date was 1 May 2015. The end date will be 28 February 2021. We are developing nano-scale light-emitters to improve the disinfection of drinking water and thus reduce the large number of people who are affected by diseases that result from poor water quality. We can further enhance these applications by creating three-dimensional (3D) nanostructures. As such, we are developing nanostructuring processes on a manufacturing scale to unlock the potential of III-Nitride semiconductors in a range of innovative materials and devices. This EPSRC-funded project brings together research expertise from the Universities of Bath, Bristol, Sheffield and Strathclyde. At Bath, we have developed the core capability of wafer-scale (up to 150 mm diameter) nanopatterning. 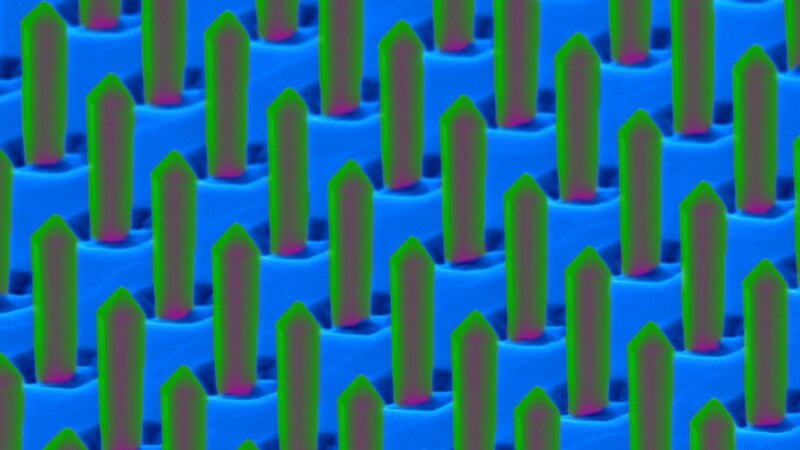 We've done this using nanoimprint lithography and a newly developed technique, Displacement Talbot Lithography, a potentially disruptive technology for generating nanostructures. We've integrated these lithographic techniques with additive and subtractive processes to form 3D nanostructures across whole wafers. We have gained valuable knowledge and expertise in using Displacement Talbot Lithography. And we have developed modelling tools and added further features to the technique to extend its applicability. At Bath, we are using the nanofabrication techniques to develop manufacturing processes for the growth of metal organic vapour phase epitaxy (MOVPE) of nanostructured light-emitting diodes that emit visible and ultraviolet light. We have focused on creating a novel device architecture comprising core-shell nanorods. This offers the promise of improved efficiency over more conventional architectures. The wider consortium will create non-polar and semi-polar GaN templates. These will address the persistent problem of the quantum confined Stark effect limiting the efficiency of light-emitting diodes (LEDs) and GaN-based laser diodes. The project will develop the computer-aided design method known as Designing Centering for process optimisation. This will maximise the yield of nanostructured devices (initially LEDs). Our research will also explore the use of electron beam and optical techniques. These are capable of characterising materials and devices on the deeply sub-micron scale, as production tools for screening materials and part-processed devices. Once we have established the core capability for the III-Nitrides, we will extend this to nanostructuring other semiconductors, notably InP and related materials used to manufacture devices for optical fibre telecommunications.